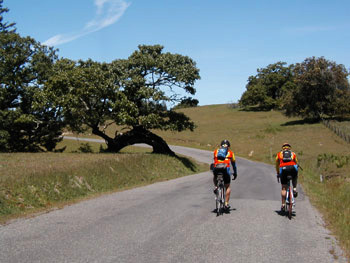 Sonoma County is considered one of the best places to ride a bike in the United States, maybe in the world. Over the years, many professional racing teams have used the region for their preseason training camps, citing the “European” nature of the roads. Many pros choose to live here year ’round for the same reason. Virtually every touring company lists a “Wine Country” tour in its catalog, and these roads are home to dozens of organized centuries, doubles, triathlons, and other pay-to-ride events. It is very popular, and with good reason. There are so many wonderful roads—most of them light on traffic and heavy on scenery—that it’s almost impossible to hit them all in one, brief visit. Indeed, when we laid out our One-Week Wine Country Tour, we lamented all the roads we had to leave out on our way through the area. This little three- or four-day tour does a good job of finding those missing roads. By staying in one place and exploring the immediate neighborhood more intensively, it actually samples more of the nice local roads than the longer tour. Think of it as a concentrated, high-powered dose of the best of what this best-of-all-possible cycling regions has to offer. In my opinion, this is the nearly perfect Mini-Tour…at least if your goal is cycling perfection. Each of the three main routes is distinctly different, and each is an absolute gem of a ride. Each goes off in a different direction—one to the north, one to the south, and one to the east—and a grand total of one mile of road is duplicated in the entire tour. All three routes begin and end right in the center of Occidental, within a block of the lodgings in town. Best of all, there is the scenery. 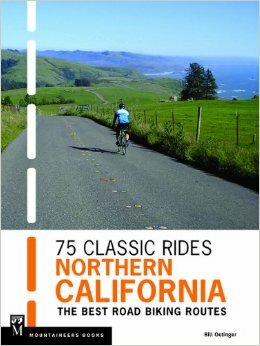 Aside from one two-mile stretch of road on one route that passes through some suburbs, these stages are all rural and all spectacular, from hilltop, sheep-cropped meadows to sweeping ocean vistas to little lanes through the vineyards. It would be hard to imagine a three-day package that is more consistently beautiful and cycle-friendly. Occidental is an excellent venue for staging the tour. Perhaps the only knock on the town is that there isn’t a great deal to do off the bike. It’s a quiet, charming village, with a few interesting shops, but the entire town can be explored in one half-hour stroll. There isn’t much in the way of night life, aside from a decent local pub. There are two huge, classic Italian “family-style” restaurants with hearty menus that virtually define the term “carbo-loading.” Other restaurants and cafes come and go, depending on the whims of culinary fashion, but the old Italian places endure. This mini-tour can easily be combined with the four-day Napa Valley Tour for a comprehensive, week-long exploration of the North Bay. You could do the Leftover Loop (see below) on the travel day between the two tours. This is the big one, the really challenging package. It heads down to the Russian River and then up into the steeply folded ridges to the north of the river. This ride is legendary. One bike magazine writer called it “God’s cycling theme park” and “the land of dreams,” while another stated, “without a doubt, the most beautiful road I’ve ever ridden.” It’s hard work, but worth it. Numerous steep climbs, but the payback comes in the form of spectacular scenery and several Mr. Toad’s wild ride downhills. If you’re a fit, experienced cyclist, this ride is a must. An unforgettable experience. Suggested shortcuts: 31, 40, 55, 66 miles. Slightly less arduous than the Northern Loop, but still with a few challenging climbs (and also with some really rollicking downhills). Actually spends about half its time out of Sonoma County, exploring the quiet, empty northwest corner of Marin County. Visits the quaint little towns of Freestone, Valley Ford, and Tomales and rolls alongside pretty Tomales Bay, with the magnificent Point Reyes National Seashore as the panoramic backdrop across the water. Winds back north through peaceful valleys and over some fairly hilly ridges with views almost as grand as those on the Northern Loop. Travels through open, rolling dairy country and through hills covered in apple orchards and deep forest. Suggested shortcuts: 21, 33 miles. The longest, but probably the easiest of the three rides. Still contains a few hills, most notably two short-but-steep pitches in the final seven miles, climbing back up to Occidental. This is our wine country offering, with most of the ride meandering through the vineyards of the Alexander, Dry Creek, and Russian River Valleys…some of America’s most prestigious and most beautiful wine regions. Interspersed with the rolling vineyards are sections of dairy country, horse ranches, orchards, and woods of oak, redwood, and bay…and also that brief visit to the suburbs mentioned above. Suggested shortcuts: 28, 55 miles.